We have mentioned our pitch in a couple of posts. In this post we share a snapshot of our presentation. Let us know how you like it! So, we're automating the tedious task of keeping a diabetes diary. We start by explaining diabetes briefly. Diabetics need to track blood glucose levels, carbohydrate intake, insulin dosages, physical activity, and changes in weight. To get along in everyday life, but also to be able to make improvements to their treatment. It's nowadays really easy to track all that information. 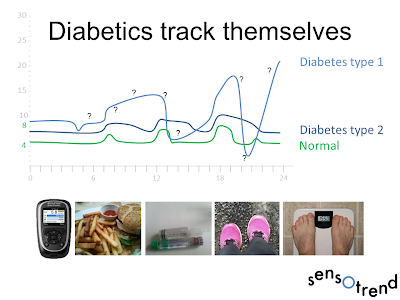 Diabetes devices produce rich logs, and we can choose from dozens of pedometer and sports tracking apps, activity tracker gadgets and meal loggers. The problem is that there is no way to bring all that gathered data into a single user interface that presents it in a way suitable for diabetes treatment. That's what we do. We collect data from multiple sources, build adapters where required, and store that data to emerging Health Information Exchanges. 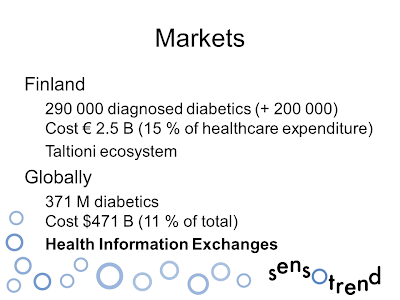 Taltioni is a Finnish initiative, Microsoft's HealthVault is an example of an international solution. 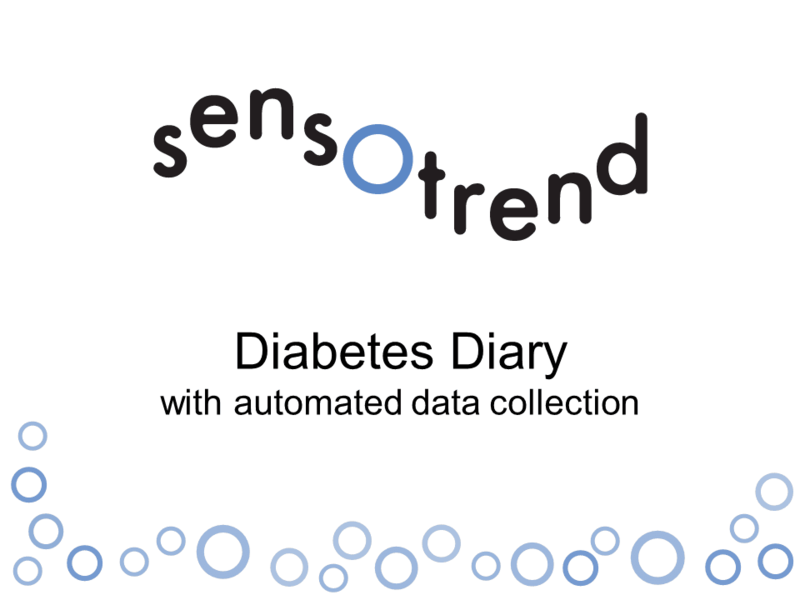 We visualize the data for diabetics and their healthcare professionals. Also healthcare organizations benefit from the gathered data. They can, for instance, rationalize the provision of glucose test strips based on actual consumption, and also use the data to categorize diabetics to be able to offer most suitable, personalized treatment. Those are just the immediate savings. Of course improved treatment reduces the additional cost of complications that occur if diabetics are not in control of their condition. 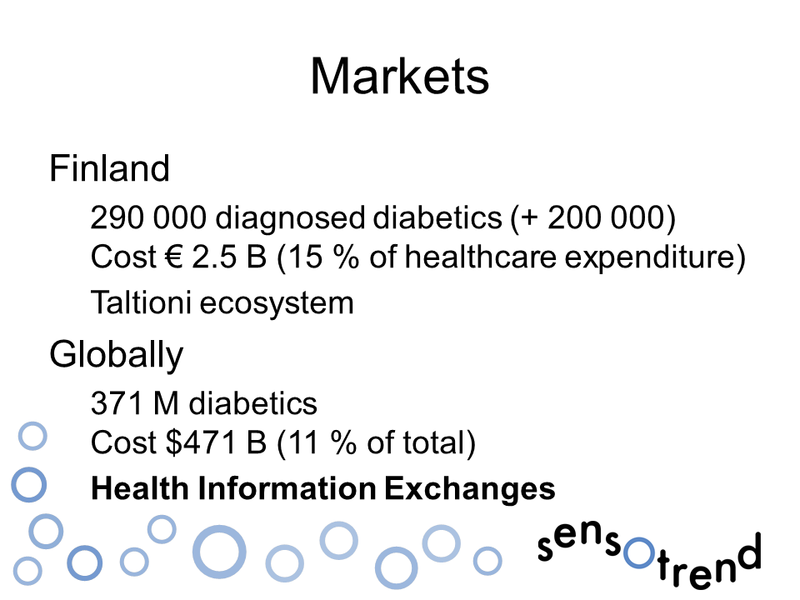 The size of diabetes treatment market is huge, almost half a trillion! If every tenth diabetic would use our service and we'd charge just one dollar per patient per month on average, our yearly revenue would be half a billion. 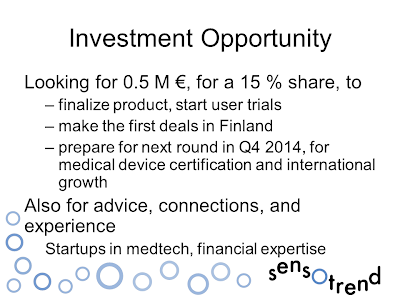 Finland is a good place to launch our service. Type 1 diabetes is more prevalent than anywhere in the world, and we already have a Health Information Exchange in operation. Once such platforms launch in other markets, we want to be ready to offer our service. We want to be a global company, helping all diabetics all over the world. We're currently a team of three. We know diabetes, software, and marketing really well, but would appreciate some expertise in financials and business execution. Would you know a good candidate to join our team? 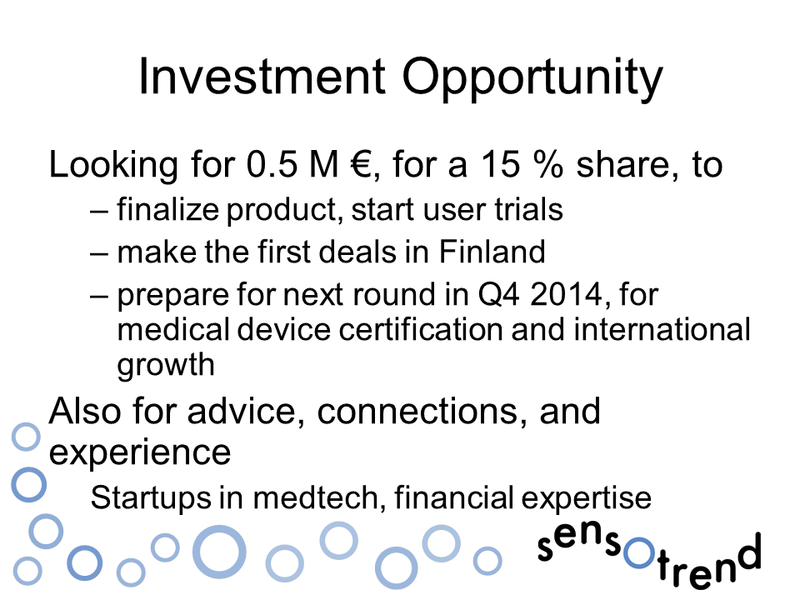 Talking of financials, we're looking for 500 000 € seed funding to finalize our product, get the first deals with healthcare organizations, and to prepare for an accelerator round in late 2014. During the accelerator phase, we plan to go through the medical software certification processes and get the first international customers. We're expecting the emerging Health Information Exchanges to become widely adopted from 2016 onward, and want to be a globally recognized company by that time. Finally, some buzzwords related to the field we're working in. If anything of the above resonates with you, get in contact with us. You can schedule a meeting with us at the SLUSH conference through this page, connect with me in LinkedIn, or email me at mikael.rinnetmaki(at)gmail.com.